Australian designer Marc Andrew Newson is one of the most important in the world as industrial designer. He has mainly dealt with interiors and household objects; his works are kept at the Museum of Modern Art in New York and at the Pompidou Center in Paris. Born in Sydney (Australia) in 1963, Marc Newson spent his childhood traveling in Europe and Asia, before studying jewelry and sculpture at the Sydney College of the Arts. Still a student, he begins to make experiences and experiments in interior design. After graduating, in 1984, he won a scholarship from the Australian Crafts Council and prepared an exhibition – including the Lockheed Lounge – at the Roslyn Oxley Gallery in Sydney. When the Japanese entrepreneur Teruo Kurosaki proposes to produce his projects, Marc Newson moves to Tokyo, the city where he lives and works from 1987 to 1991. Here he produces articles such as Orgone Lounge, Black Hole Table and Felt Chair, which participate in numerous exhibitions in Asia and Europe. In 1991, Marc Newson opened a studio in Paris and received assignments from prestigious European companies. In the mid-1990s, Marc Newson also designed a series of restaurants – Coast in London, Mash & Air in Manchester and Osman in Cologne. Black Hole Table. 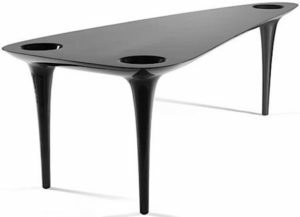 This table is made of carbon fiber and has three legs that position the table top comfortably. It’s blessed with black holes on three corners. In 1997, he moved to London, where, together with Benjamin De Haan, Marc Newson Ltd opens, a larger studio capable of carrying out more ambitious industrial projects. Since then, he has designed glass items, kitchen and bathroom accessories, household items. Newson also designed the interior of the Falcon 900B private jet, the MN01 bicycle for Biomega in Denmark and the 021C concept car for Ford. 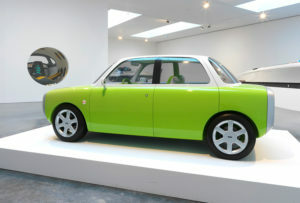 In addition to winning numerous awards, Marc Newson has participated in various exhibitions. He created Bucky (installation-sculpture) for a show at the Fondation Cartier in Paris in 1995 and a recent retrospective of his work was held at the Powerhouse Museum in Sydney. Marc Newson’s projects are part of the permanent collections of the Museum of Modern Art in New York and the Pompidou Center in Paris. Marc Newson is Adjunct Professor of Design at the Sydney College of the Arts and curator of the 2001 Conran Foundation Collection at the Design Museum in London. What Are His Best Known Works? From mobile phones and restaurants, to a private jet and Ford concept car, Marc Newson has executed a range of projects in the past twenty years that most designers barely dream of. Lockheed Lounge (1988). Made out of riveted aluminum sheets. 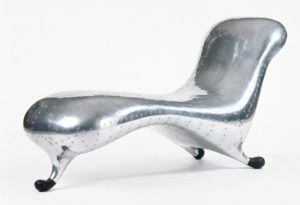 Marc Newson’s Lockheed Lounge is the world’s most expensive sofa. In fact, in 2009, the aircraft-inspired sofa was auctioned for $1.1 million and in 2015, it became the world’s most expensive design item when it was sold at auction for ca $4.69 million. The Lockheed Lounge gained international fame in 1993 when Madonna used it in the music video for her track Rain. 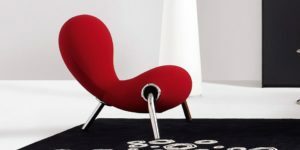 There might be more comfortable seating than a sofa produced in the style of a wing of an airplane – but when Australian designer Marc Newson first unveiled his slender armchair in 1985, at an exhibition in Sydney, the world of design loved it. Newson has therefore developed a small series. The organic-shaped Lockheed Lounge, named after the American aircraft manufacturer, consisted of glass-fiber reinforced plastic covered with thin riveted sheets of aluminum. The Orgone chair, which is more open at the top and bottom, has an organic, smooth and soft design, and is already one of the design classics. Furthermore, the cult object is displayed in numerous internationally acclaimed design museums (including the Design Museum London, Powerhouse Museum Sydney, Philadelphia Museum of Art).. Despite or due to its organic structure, the Orgone chair is ergonomic and extremely comfortable. 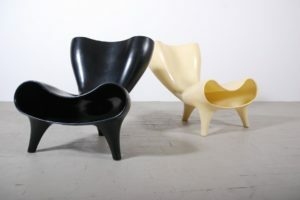 Today, the Orgone chair is produced by the German company Löffler and consists of polyethylene. The armchair with an organic form is applicable both inside and outside. The mass-dyed plastic is produced in one piece, in a complex technological rotation process. How Can We Identify Ingels’ Style? Marc Newson is one of the most complete and influential designers of his generation. He has shown great and versatility, developing a variety of creations: chairs, glass objects, a bicycle, restaurants, a recording studio and the interior of a private plane. Its customers are companies in Europe, North America and Asia. «I always start my projects on paper. You can draw a curve on the paper and know immediately that it is the right one, but you can not do the same to the computer; the curve is not realized with a function or using a digital guide, it is a form that is drawn freehand. But then you can scan it and develop it.” said Marc Andrew Newson. 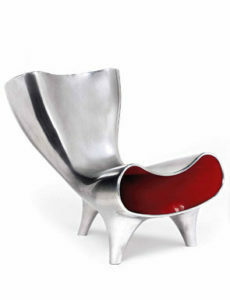 Many of these early projects are characterized by the use of access color experimented with exhibit units, mediated by Marc Newson through the knowledge of British pop art and the Australian popular culture of the surfer, which is made explicit homage with the flamboyant “Embryo” armchair (1988), covered with a red waterproof fabric.